The Sherman County District Court's courtroom on the Sherman County Courthouse second floor is full of Art Deco detail. Courtroom is through the double doors opposite the staircase and elevator. District Judge Scott Showalter calls it "the most beautiful courtroom in Western Kansas." Furniture and decoration are mostly original from the 1931 construction. Chandeliers studded with light bulbs hang from a ceiling of gray tiles laid in a herringbone pattern. Ceiling is edged with decorative tin. The chandeliers are somewhat impractical as the glare from their uncovered light bulbs can be blinding. Tiles on the floor are set in a black and maroon pattern. Wooden triangles decorate the door frames. 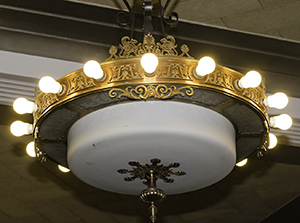 Ornate bronze lamps adorn the judge's bench. 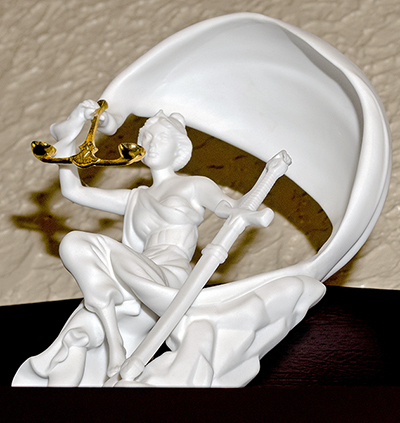 The statue above the judge's bench holds the Scales of Justice. The photos on the wall above the judge are of previous Sherman County District Judges. The first three of those judges have an evergreen tree planted in their memory on the southwest corner of the courthouse lawn. Please be quiet if court is in session. Before taking photographs, ask in the District Court Clerk's office to the right of the courtroom. Open Monday-Friday 8 a.m.-5 p.m. Mountain Time except on federal and state holidays. Some offices are closed over the noon hour. Handicapped accessible door is on the south side of the building. Best time to visit is in the afternoon when the court is less likely to be in session. Try to ring Central School Bell near the courthouse's Broadway Street entrance. A benchmark is near the flagpole. They Came to Stay stands on the courthouse grounds. The mysterious Kansas Room painting and the rescued stained glass window are in the library across the street. More Than Words stands in front of the library entrance. For more Art Deco, visit Goodland High School and United Telephone Building.